Instead of having a large house, most homeowners these days prefer a well-balanced indoor-outdoor living setup. To accomplish an equally satisfying outdoor lifestyle, one starts with patio design. In this article, get 5 patio design tips to help you get the best out of your patio! Shortlist possible locations for your patio. Consider where or which area of your backyard is most suitable for a patio by thinking of its closeness to any of your home’s doorways, space, the amount of sunlight and shade the space gets and the view. These factors are important in helping you figure out the proper orientation and layout of other elements for your custom patio. Privacy screens serve a second function. Not only do these screens give you security, it can also be a partition for your yard and using the right type, can give you shade and limit the harshest rays of sunlight from reaching you on your patio. Take note of how sunlight reaches the area all throughout the day. If you plan to enjoy staying in your patio, observe how the amount of sunlight your patio location gets. This will give you an idea whether you need a patio cover or not and how to arrange your patio furniture for a comfortable stay. Pick a function you’d like your patio to serve. Whether it’s for cooking, dining, afternoon tea, a gathering or sunbathing, deciding on this function will help you visualize a design that fits the function. This will also guide you into picking the right patio material, furniture and other furnishings. Maximize your patio’s functionality with proper lighting. Enjoy staying on your patio long after the sun has set with the right lights installed. With proper lighting installed, you can continue with your outdoor activities long after the sun has set. While the pergola’s origins come from Roman gardens where it was used to cover walkways, this charming outdoor structure has evolved with the times. In this article, we share a few of our favorite pergola projects which helped bring charm back into the backyard and functional outdoor space. A small, neat pergola sits atop a firepit haven, making the space defined yet tucked in its cozy corner. While the allotted space may be small, it has transformed and maintained a pride of the place it owns. Keeping it protected while still having that open, airy vibe, this pergola makes the side spaces of a home more endearing with its classic architecture. Instead of the limiting solid patio cover, a pergola opens up the space, making it look larger than it is. It’s also a welcome feature since the space was intended to be a grilling station, letting all that mouthwatering aroma float freely through the open air instead of being blocked by a roof. Covering a walkway, this pergola is also home to a woody vine which can carry its own weight. While pergola kits are becoming popular, its limitation lies in being able to support lovelier but heavier vines. If you plan to let vines and other climbing plants run through your pergola, it’s much better to opt for a professionally-installed. This will give you more freedom to choose which materials will be used in your pergola and assurance in its structural integrity. You can also have it customized to fit the space. The mission was to make their favorite outdoor seating area, open, airy yet still shaded, and the solution was to install a wooden pergola. With its high beams and rafters, this pergola achieved providing ample shade without making the open patio feel closed off. Being in the custom patio and deck building business, we look back at some of the most creative custom patios we’ve built all over Houston and nearby neighborhoods below. Want to lounge by the pool? Rain or shine, you can certainly do so with this neatly covered patio outdoor space. There’s also a wraparound bar and stools surrounding the grill, perfect for a great summer outdoor party with the patio cover a seamless extension of the roofline. For the lounge area, a neat pergola is smoothly installed to provide ample patio cover. 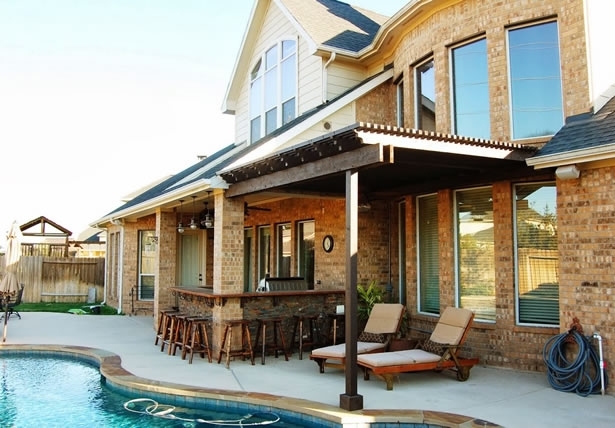 As Houston’s top custom patio builders, we always aim to work with the space you have and maximize it according to your needs. For a family that loves to grill, a standalone custom-built outdoor room is the perfect structure to construct in their free space. With an ample seating area, a picket border, and space for a moveable grill, it easily becomes a fort for good food and great time whenever the weekend comes! This airy setup also lets smoke easily waft into the air without leaving your house smelling like grilled meat a week after the party. This family home simply adores arbors that they had two pergolas installed. Complementing their brick border and paver patio surface, their patio remains airy and free, while still being elegantly covered against the harsh sunlight or rain. With no nearby roof to extend, a pergola provides a charming patio cover option which can easily be installed, without ruining the existing exteriors of the home. Aside from these custom-built structures, we can also add porches, pave your driveway, create borders and build outdoor rooms, kitchens or fire pits! Call us today for a free, no-obligation consultation or schedule a free in-home estimate today. As Houston custom patio builders, let us know what dreams you have of your outdoors and we’ll help you achieve its potential! Does your patio lack the buzz and vivacious you see in home magazines? Envy no more for we bring you 4 design details that will surely make your patio pop and look full of life! Often overlooked and simply treaded upon, a patio surface highly contributes to the definition of your outdoor space. Choose a patio material that is durable against the elements yet easy to maintain. If possible, install it in a vibrant shade that packs a punch for great visual detail. Now it’s no longer a mere open space, it’s a well-defined territory. What’s the use of a well-defined territory if you can only enjoy it very early in the morning or late at night when the sun’s heat isn’t too much, right? Let a patio cover provide ample shade for your outdoor area. You can choose a mobile umbrella, a semi-patio cover like a pergola or lattice or a solid patio cover which extends your roofline. Now that you’ve got the shade element covered, what happens to those cold summer nights? Installing a fire pit is the answer. If you’re more of a night owl and love to stay out stargazing but can’t because of the chill, having a fire pit to provide warmth will make your outdoor room hospitable even in the cold of the night. Do you have friendly neighbors who are just too friendly and keen to know you more? If you value your privacy, setting up some privacy screens can keep your home activities safe from curious eyes. Now your privacy screens not need be eyesores in your yard. You can have tall perennials planted at the perimeter of your house, some trellis covered with beautiful crawlers or even homemade murals or graffiti to provide enough interest for onlookers’ eyes and privacy for you! Explore these 5 porch ideas for a summer-ready porch ready to make the best memories for a truly unforgettable summer season! Afternoon naps are best done in the comfort of a hammock. Making you feel secure and comfortable with a gentle breeze swaying you softly, feel like a well-rested newborn babe after your siesta in a hammock conveniently placed by your back porch. While a hammock may look appealing for a back porch, it might not be that attractive for a front porch. Instead of a porch swing, why not hang a porch swing for your front porch. Perfect for unwinding after a long day’s work or catching up with loved ones and friends, this porch feature will surely remind you to let loose and unwind from time to time. Porches look inviting especially on calm, starry nights. However, the chill might prevent you from staying out for too long. With a fireplace by your feet or at a prime location, make your porch feel as warm any indoor room you have but with a greater view. For those who want privacy, peace and quiet away from insects which buzz perpetually and disturb your porch stay, a screen does the job well. However, if you have pets which have the tendency to claw their way or scratch habitually, half-walled screens prevent a scratching disaster to your screens. You can also install a pet flap to let your pet come and go as they please. Whether hanging or potted, plants give your porch a charming look. If you like an open porch, potted plants can serve as a great substitute for a screen in keeping insects far and away from your porch area. Try plant combinations like lavender and chamomile for a calming and insect-repellent effect!